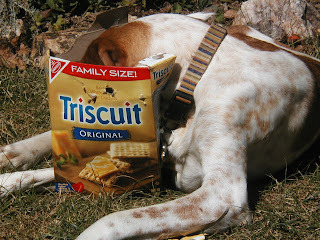 Are you sure there are no more Triscuits left? We went for a walk early this morning and met Jilly and her dad. Jilly's dad introduced himself as Tom and we talked about how you always know people's dogs' names but never know the owner's name. That's why Tom introduced himself. Tom had a bag of poop in his hand. "Ray has never pooped outside of his own backyard." I bragged. We chatted a bit more and then Ray and I continued on. Just as we passed Jilly's house, Ray wandered into a yard and took a dump. I stood there flabbergasted, watching my dog and wondering what to do. I didn't have a bag to scoop the poops. As we turned to walk the rest of the way down the street, I saw Tom and Jilly walking up. I was pretty sure he had seen what Ray was doing and I knew that now my neighborhood reputation included big liar as well as a.m. beer drinking. "You know how I just told you that Ray has never pooped outside of his yard?" I said to Tom, "Well he just did and I don't have a bag." "I can't help you," said Tom, who by this time was carrying two bags of poop. Ray and I continued down the street, I was eyeing the morning newspapers tossed outside of houses on the sidewalk, wondering if I could get up the nerve to take one out of its bag and leave the paper on the front porch. Instead when I got home, I grabbed a handful of bags, drove back to the yard, and picked up the poop (it was on my way to the grocery anyway). I thought sadly of the end of the poopless era. In the afternoon (after a couple of hours of gardening - Ray is a natural! ), I ran to the fabric store to get some fleece. I wanted to make a new bed for Ray; something smaller than the one he has, with sides like a big cup. I looked around the store and spied exactly what I wanted high up, stashed above the shelves. "Do you have any of that fleece somewhere lower?" I asked the woman at the cutting table. The woman walked me over to where the other fleece was displayed. Nope, not there. "There's more over here," she said. We walked over to some more bolts. "Here it is in white," she said. "No," I said, "I think my dog want's that one." I pointed to the 'natural' sheep colored one. Being a wool hound, I just knew that Ray would only be interested in 'natural.' The woman obligingly got a ladder, climbed up and handed me down the bolt. She rolled out a piece, picked off some hairs and fuzz, and while she was cutting me a couple yards and said dubiously, "You should know that it's going to pick up hairs. And it says to machine wash delicate and hang to dry." "I don't care," I said, "I'm sure my dog will love it." I drove home and walked in the front door holding the fabric (I had declined to take a bag.) Ray met me at the door, ripped the fabric out of my hand and started to kill it, whapping it madly about his face. I laughed and tried to get the fabric from Ray. I pried it from his jaws, took it upstairs, cut off a strip and five minutes later had it sewn together, with a bit of stuffing in it. I carried it down and threw it to Ray who joyfully tore into it. He ran outside with it and tore around the yard at full speed. He was ecstatic over his new toy. I congratulated myself on really knowing what my dog would love, maybe just not in the way that I had envisioned. I had pictured him snuggled up all cozy, not violently shaking the thing to death. A minute later, Ray had torn a hole in it large enough to pull out the stuffing. I grabbed the toy from him, de-stuffed it, and tossed it back. The fleece, a little worse for wear was collecting leaves and sticks adding to its crunchy goodness. Ray continued to tear into it, killing it good, running around with it in his mouth. Maybe this wasn't the best choice of fabric for Ray's bed but it was definitely something that he loved. He was having a great time. Haha, I gave up on most dog beds/crate pads a long time ago. Goodness only knows how much I've spent on them, and they always get destroyed. 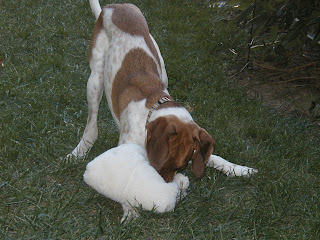 The dogs love the stuffing. We put pieces of carpet in the crates, and I'll tell you what makes a great, relatively inexpensive but very large dog bed - a papasan chair cushion. You can get them on sale at Pier One or World Market.